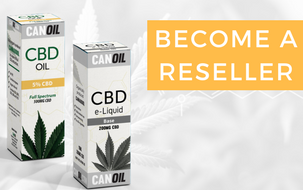 Canoil is a producer of CBD Oil and CBD E-Liquids. We supply only shops and resellers. In addition, we are always looking for a CBD distributor. Are you looking for a wholesaler to buy CBD products or do you want to become a CBD Distributor then you have come to the right address. You can create your wholesale account quickly and online! Visit our registration page We are always looking for new and reliable partnerships. This, of course, also means that we can offer our CBD products at attractive and competitive prices. Canoil CBD products are produced 100% naturally and are always subject to the strictest quality standards according to ISO 9001 to ensure excellent quality. We manufacture one of the purest and best CBD products in Europe. We are sure Canoil is a valuable addition to your business! Our professional employees are able to answer any potential question about our products, prices and/or conditions. If you are interested in selling Canoil products, please do not hesitate to contact us at info@canoil.com. To create a purchase account, please visit our registration page. After registration you can send an e-mail to info@canoil.com with the request to convert your account to a purchase account. We will process your e-mail within 24 hours.